Mixing Politics and Religion the way our Founders did – because politics alone legalizes Darkness, while religion alone keeps its Light under its "bushel". Saving America and saving her churches can't be done separately! Would you be interested in my past month? It explains a project yet unresolved. If this goes wrong, this could be about as embarrassing as anything I have ever done. I am almost finished building a float for the 4th of July parade, and the car I’m building it on still isn’t quite reliable. Can you imagine being stranded in the middle of a huge parade? 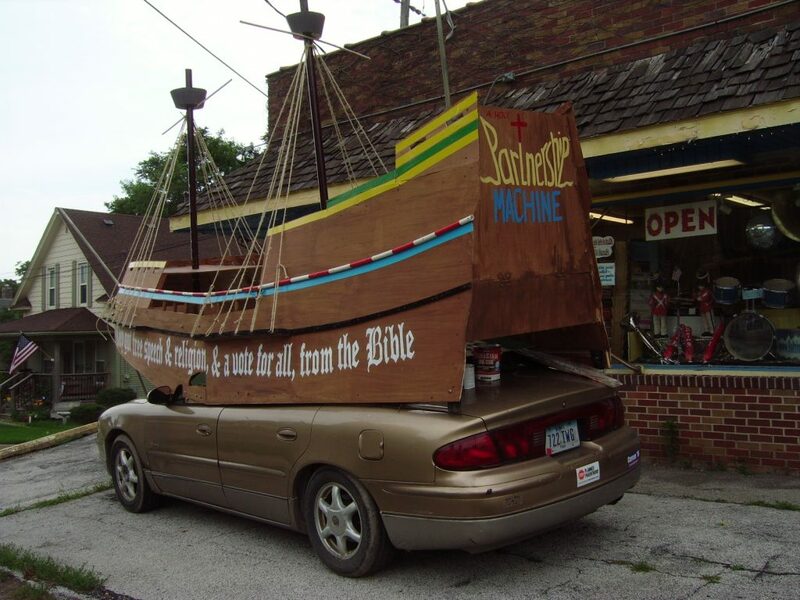 With a message involving the Pilgrims and the Bible? 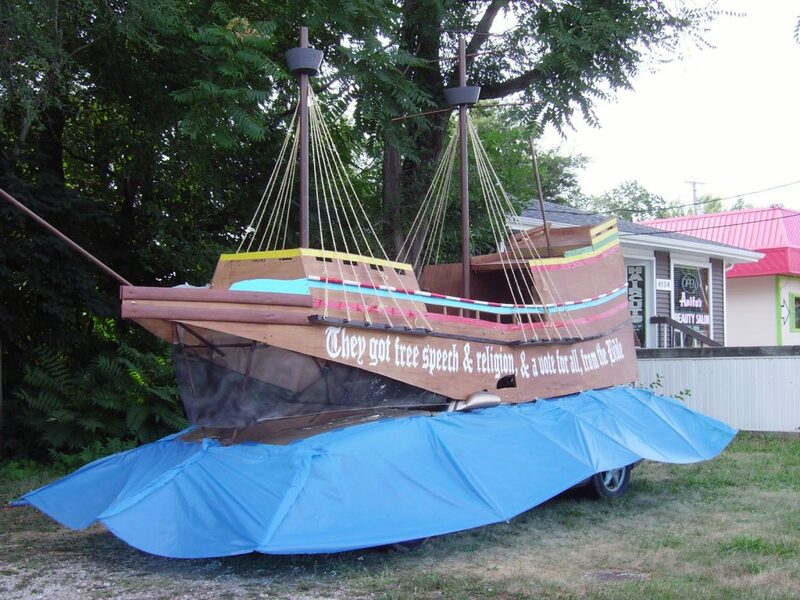 Documentary, “When Freedom was Reborn”, backing up the claim on the side of the float: “They got Freedom of Speech & Religion, and a vote for all, from the Bible”: www.1620.US. Almost every day I thought the car was fixed, only to have a problem later. Share with me this “adventure”. 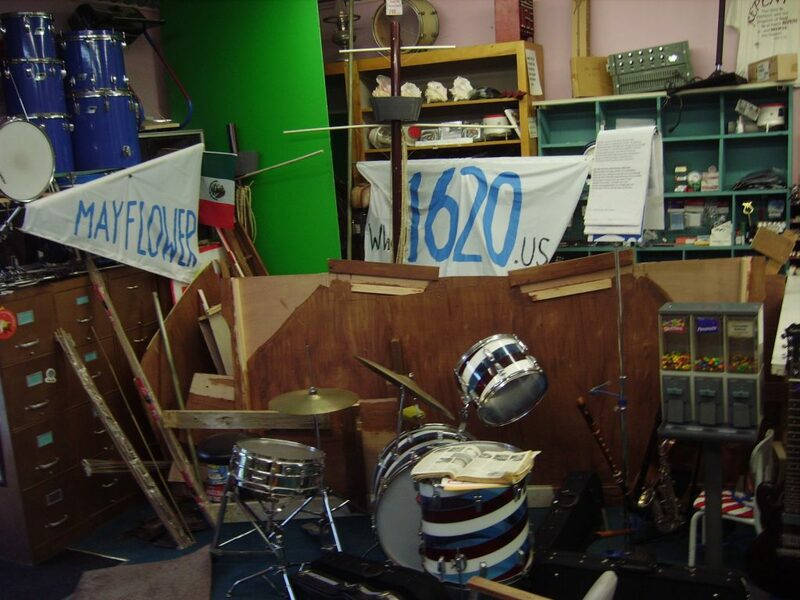 I started building the Mayflower Float in preparation for the 4th of July parade, the largest attended in Iowa. One passenger was Ruth Hahn, the official Historian of the Society. She helped people document their genealogies. 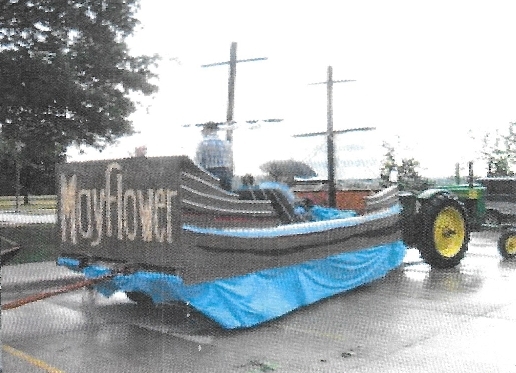 In 2012 I proposed building the float on my car, to make it easy to transport to other parades – the corn wagon we used is very unstable on highways. It careens back and forth dangerously. But they nixed the idea of building on a car – too unsafe, they said, upon reviewing my design and model. In 2014, two lawyers on the Society’s board decided we shouldn’t enter another float unless the float is insured, and insurance costs $300 for one day, way too much, so they nixed the idea. 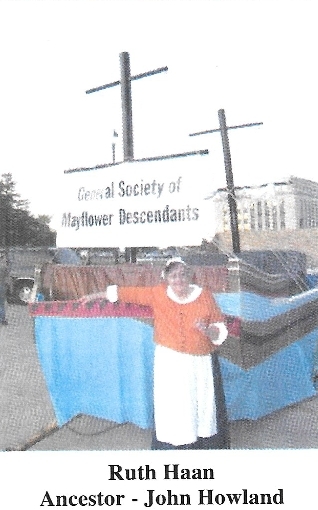 Not only would they not permit my float as a Mayflower Society project, but they said I could not even do it on my own – unless I quit their organization! Not only that, but even after I quit their organization, I could not even mention their organization on my float or on my parade application as a place where people could learn more! They imagined that such a remote association would still create liability for them if there were an accident! I quit in order to make my float the following year. But it took four years. 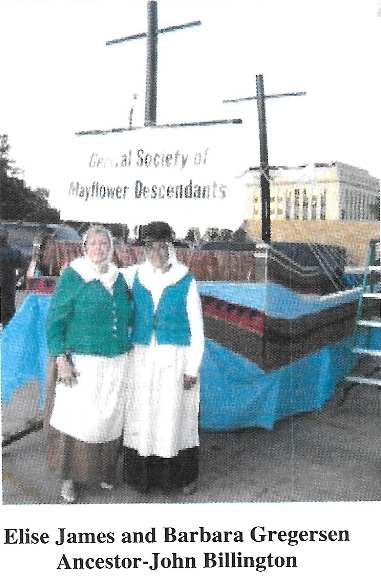 Partly because the car became temperamental, partly because I was unsure of a design, and partly because it was hard to think of messaging for the float that avoided any mention of the Iowa Society of Mayflower Descendants. As it turns out, when a float is built on a car, the auto insurance covers it. I read my Travelers policy carefully, and asked the agent if there were any more “fine print”, but there was none, and no exclusion was indicated for driving in a parade. The Urbandale parade application asked for the name of our auto insurance. 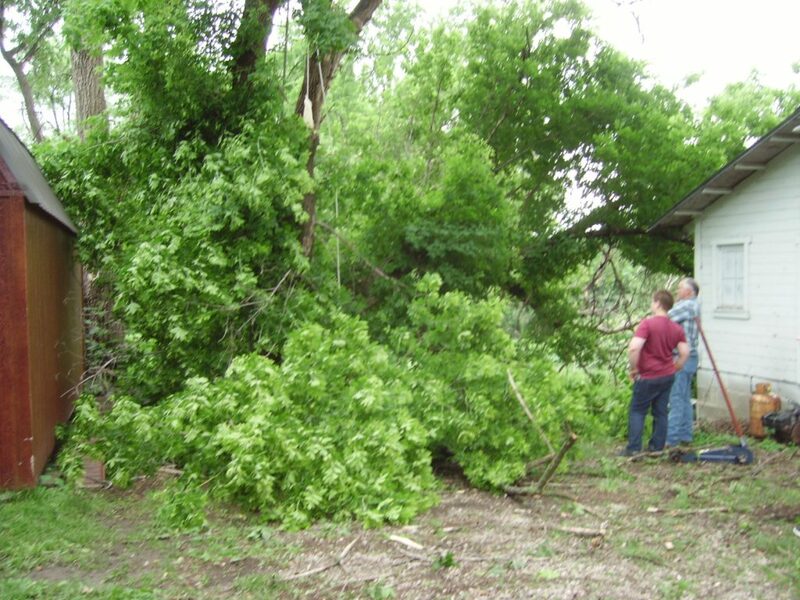 A week ago storms split a huge tree down to the ground, with half of it leaning towards a $10,000 shed that Mike is making payments on. I took several pictures. The miracle was (1) it split far enough to warn us of the urgency of action – with another storm coming the next night there was no time to even think about hiring someone else, even if we had the money; we had to take it down that day. And yet it split that far, without causing the least harm! 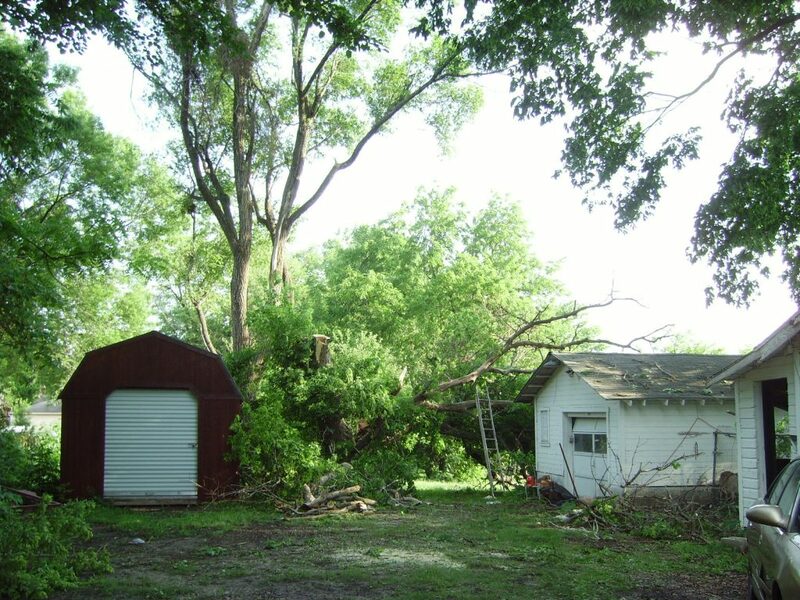 (2) Every cut I made resulted in trunks falling not just away from the shed on one side and our garage on the other side, but absolutely perfectly miraculously straight between them. This was more than could be explained by the precision of the cuts I made. In fact one of the critical cuts, I couldn’t even decide how to cut it, so I started in one direction, changed my mind and started at another angle. Yet it fell perfectly. This shows the position of the ladder when I made the first cut, and shows what there was to lose if I cut wrong. 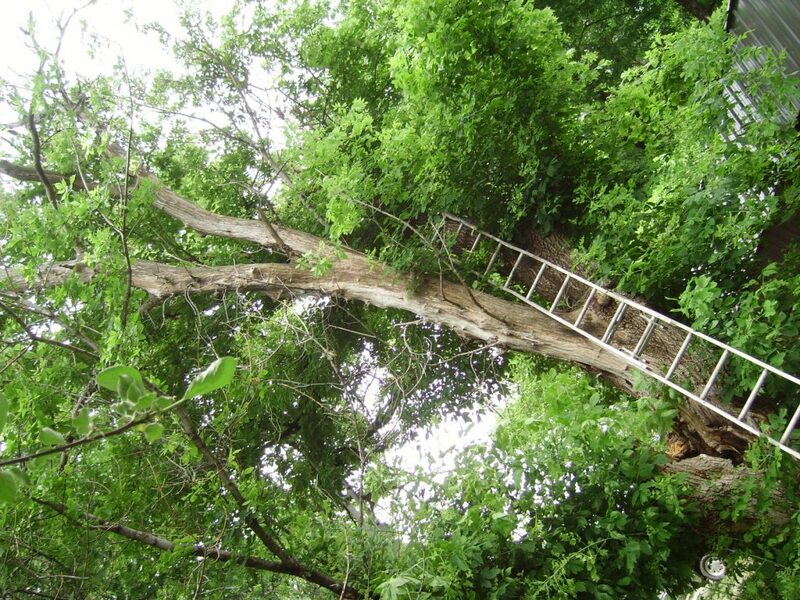 When one’s ladder is on a branch one is cutting, the branch will jump up after the cut, with that weight gone. The ladder barely reached above the branch, so I had ropes to hold me up if the branch jumped above the top of the ladder, but thank God it didn’t. 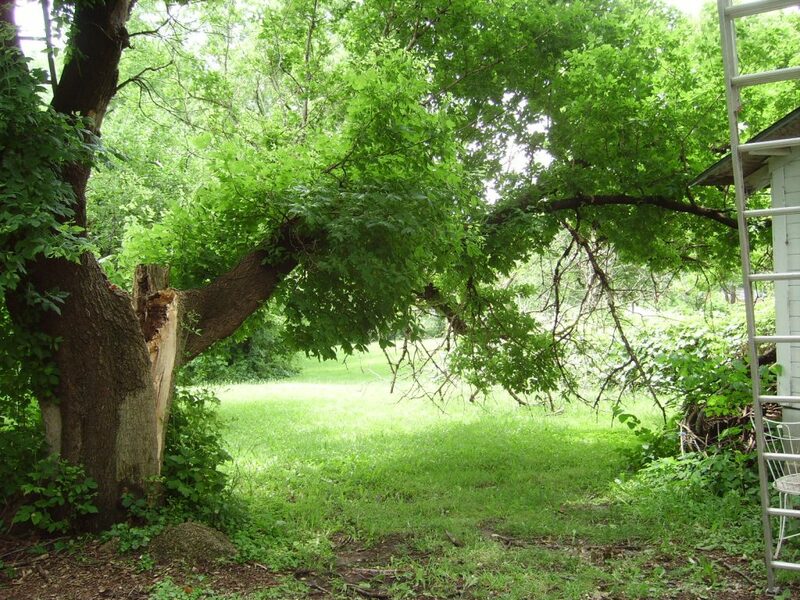 This shows how badly the trunk was split. Clear to the ground. 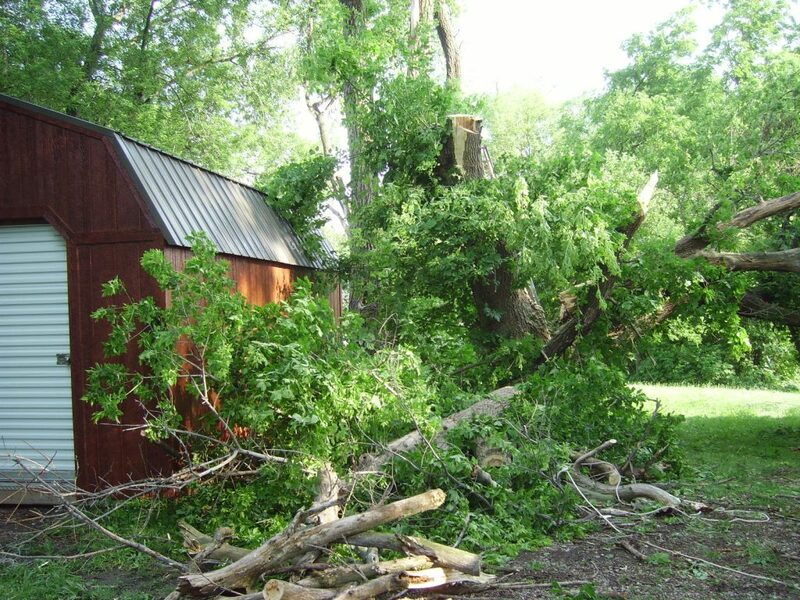 With another storm coming that night, had we waited for the tree to fall on its own, it obviously would have crushed that shed. Besides the $5,000 or more that professionals would have charged, I doubted if we could even get anyone over there that day. So it was up to me. This shows the rope tied to the car as I made that first cut. 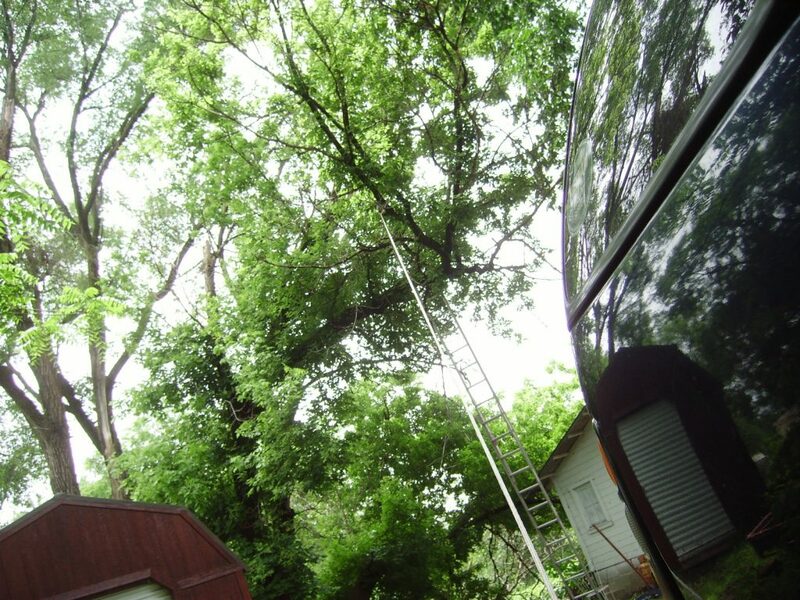 Without the rope, I was concerned that the branch would swing all the way back and knock away my ladder. With the rope, I hoped it would break and fall farther away. This shows the ladder position later, after that first cut. 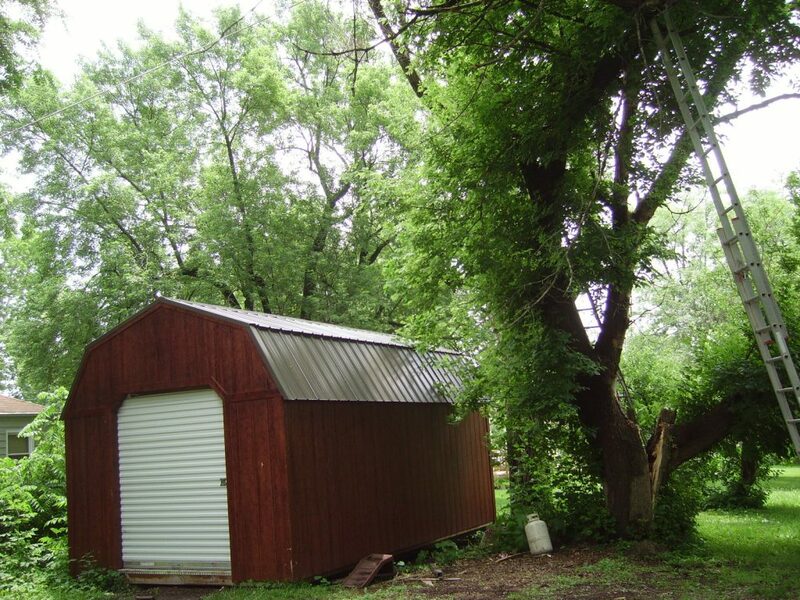 Although it was much safer for me, there was a greater risk of cutting the three very large limbs at the wrong angle so that they would demolish either our wood garage on one side, or the steel shed on the other. This shows how low the tree was on the side of the split trunk away from the shed. 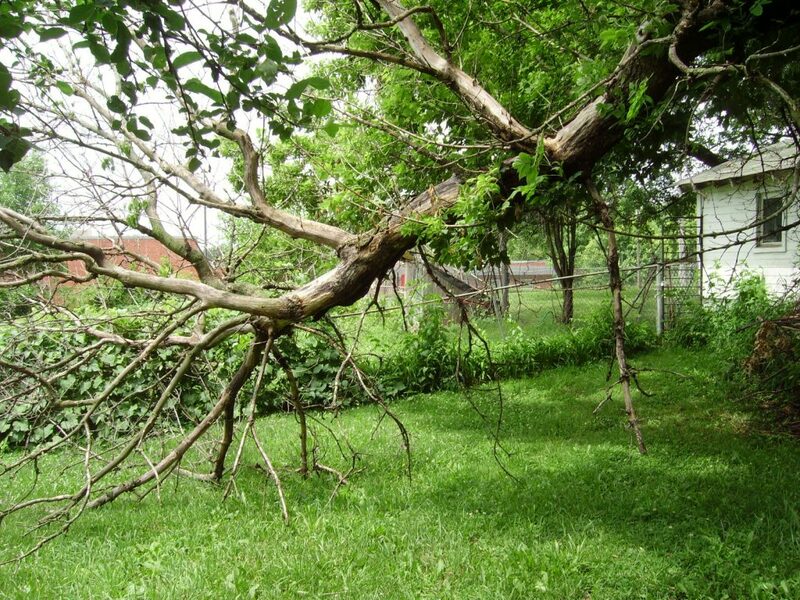 It was almost a horizontal branch for years anyway, but one could easily drive a car under it before. This was our warning about how quickly the other side was likely come down on the shed. 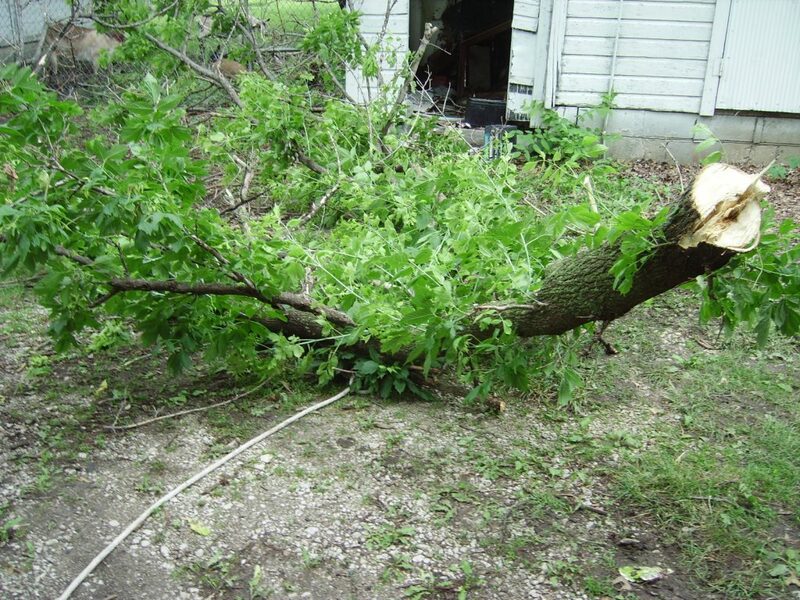 This shows the limb I knocked down with that first cut. More limbs down safely! No damage to the shed! Everything down that concerned us. The trees behind the one we cut down are undamaged. Today is Sunday. Thursday, our mommy goat was sick – healthy the night before. Friday, she was dead. Saturday night we had finally made arrangements where we could take her body. My prayer had been “make it possible for me to declare Your Name to my people.” We had planned to sell her for $250; her death would replace that with time for 2 or 3 hours of driving to dispose of her body. During that time, the words formed in my mind so clearly that they seemed to be of God, “I will heal her.” So as I monitored her progress, I took it as a test of whether a “voice” like that really is of God. Her death proved that it is not. I am left to discern God’s will the way most of humanity does today: with a combination of reason, common sense, Scripture, and hope. The car has had a problem not starting, and stalling after it is running. Error code P0336, camshaft position sensor. That is the current problem; but well before that the key stopped working – we had to tear it apart to remove the key mechanism and replace it with a single resistor. A few steps later I replaced the camshaft sensor. Now it is acting up again. For the past month I thought it was under control; I put more distance between its wires and the spark plug wires. Also I replaced all the spark plugs and wires. That fact is just fantastic. It is glorious. It gives glory to God way more than most people seem to want. I want that opportunity. I pray for that opportunity. How to make the car reliable has been outside my ability. For me to aim for a mountain requires that God will make it possible. So when these obstacles arise, either I see the “reality” of my own insufficiency crowding out my hope and I give up, assuming that I can’t be certain God will help, or I continue trying, trusting God will make it possible. Miscalculation could be pretty embarrassing. What if we get half way through the parade and the car stalls? I shudder to think! Unfortunately my wife Dorothy does not share the urgency of this mission enough to tolerate building the float on a more reliable car. But even if she did, one important advantage of this car is that it has a sun roof that opens, allowing someone to sit on the roof with their feet hanging down, in addition to someone sitting further forward with their legs on the windshield. Besides that, the sun roof allows a way to enter the car, to drive it, after the assembly of the float has sealed all the doors shut. Piled on this deadline is that the water heater serving the other half of our house (our house used to be a duplex; now my wife’s son’s family lives there) stopped working. That required a few hours of diagnosis. I finally got out the old thermocoupler and bought a new one; we’ll see if that solves it. Also I am waiting to see if the repair holds on the broken water hose on the car Dorothy mostly drives. Midnight: Wow! Turns out that before attempting the tedious test on the Buick, I just pulled out the wires, took them to the parts store to see about replacing them, ($117), and there, noticed that the serpentine belt had simply worn the insulation off two of them! So I simply put duct tape around them to replace the lost insulation, wired the wires in place hopefully well enough that won’t happen again, and now it runs! So I spent the hours I thought I would have to spend on that, on tightening up the muffler. The water heater was repaired by replacing the thermocoupler. It took a few hours, but now it works. Less than $10 for the part. I did enough driving to test the water hose repair; it holds. I had a little time left over to finish some details on the float. Tomorrow I think I will be able to take it outside and reassemble it on the car. My God, you made it possible! I did a lot today, but the car won’t start. I don’t want to put the float on the car before I get the car going reliably. The next thing to try is the $118 new wire assembly. Mike said I shouldn’t have used duck tape for insulation, and online articles agree; so I replaced it with electrical tape. But still no start. But no error codes are generated. I also spent 2-3 hours cutting tree trunks, and I climbed a ladder to remove sheet metal covering the vents at the peak of our roof. And spent more time on the float; that project soaks up a lot of time as I stare at it, compare it with the pictures, and think of how to make it more realistic. It already looks way better than the float I made 6 years ago. I hauled two trailer (4’x8’) loads of heavy cut up tree trunks from where the tree fell to my wood platform, and filled up the trailer again but didn’t unload because the platform is full. Loading and unloading was, of course, by hand. I realize there are other 72-year-old men who still have all their strength, but that I should be among their number, seems to me a miracle. Certainly I am grateful to God for it. Yesterday I bought the wire assembly. In the old assembly there was one wire dangling out of the middle of it which had been dangling there for years. Dorothy noticed it but I told her that wasn’t an important wire because it had been dangling like that for a long time yet had not stopped the car from running. But in the new assembly that dangling wire had a metal washer attached to the end like it was to be screwed to something. The parts guy said that was a ground wire. A ground wire! For years that whole assembly hadn’t been grounded! For all those years that the car had worked sometimes but not consistently! So I installed the new wire assembly. That in itself is a miracle, every time I take it on and off, because it is in such a tight space that you can’t get a thumb and a finger on it; just two fingers if you are lucky. You have to not mind the grease or the pain. The car works now! God, you made it possible! And Dorothy, thank you for prompting me to go for that purchase! When I went inside Dorothy said she heard the car run, which proves both that it starts, and that the muffler needs more work. So that night I stuffed more goop in the muffler holes. This morning the car started reliably; it doesn’t even matter, any more, if I start it with the accelerator half way down; before, if I forgot, it wouldn’t start for another hour. 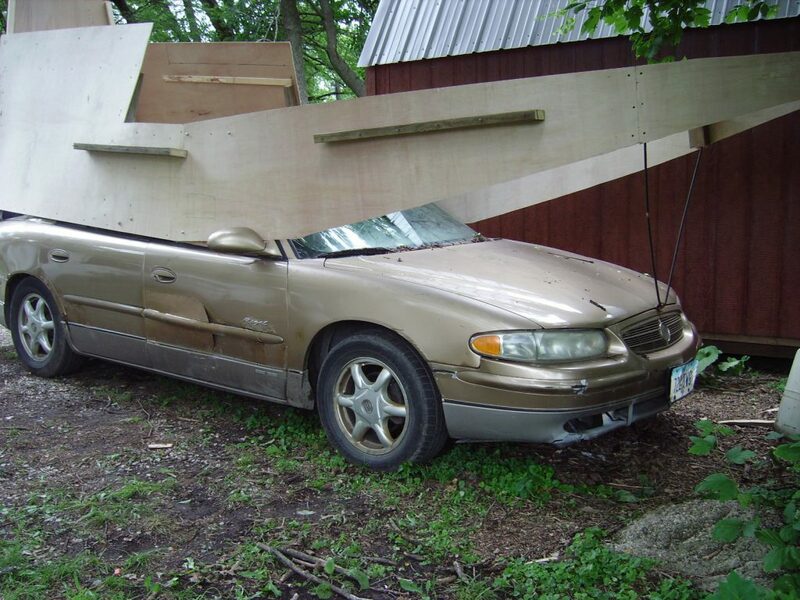 I still haven’t taken the float out of the basement and put it on the car; I keep thinking of things to add to it. I need to get it finished tonight. Oops! The car wouldn’t start this evening after work! And we’re back to a P0336 camshaft position sensor code! I came back later to the car, now stranded at work: still wouldn’t start! But why don’t I feel stressed? Because I am so close to having everything ready to proclaim God’s help giving us the freedoms and prosperity we enjoy, and I have proceeded in good faith, not recklessly, that I trust God will not bring me this close only to have it all fail. After a couple of hours I remembered that I still have one more thing to try, for which I praise God. It will take some time; I will have to take that heavy jack to the store and do the work along a busy street. Fortunately the jacked up side will not be on the street side. After I finished a couple of customer repairs I spent a half hour reviewing the directions for the camshaft sensor test, then went out to the car. But before I started the test, I tried to start the car again, and it started! I don’t imagine a test to see if something works, that obviously works, would be informative. So I drove home to work on the float. When I drove back to help Dorothy pack, the car stalled thrice. But then started again. This time the only error code was a high temp circuit; in other words, I guess, the stupid computer thinks all the radiator fluid is boiling out. That is not a new error code. This time, I suppose I shouldn’t ignore it. I should replace the sensor. Last night I got out the old water temperature sensor and got in the new; it is nearly a miracle that any modern car can ever be repaired! I had to unscrew a muffler – not that I could actually move it a whole inch out of the way, but just so by prying it I could force it a quarter inch, enough to get a full eight turn on a box wrench on the sensor. Same with the motor mount bolt. 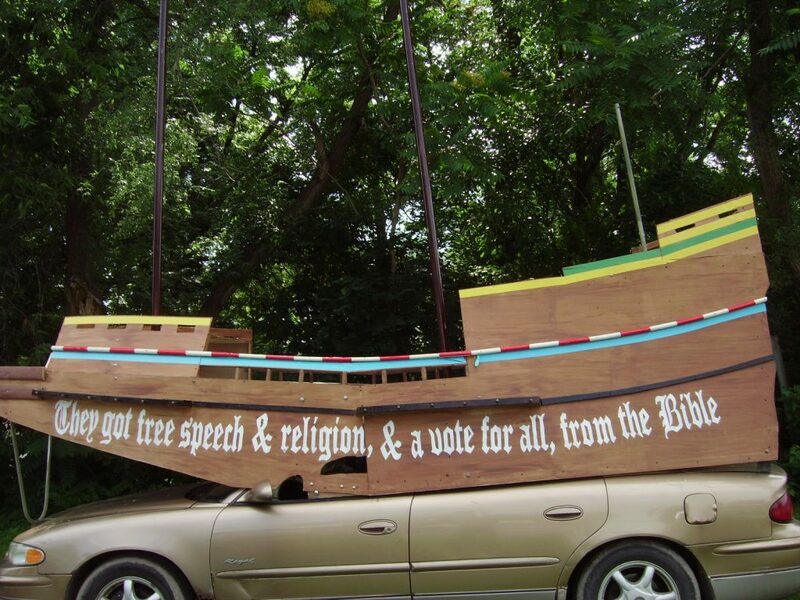 I stayed up to 1 am to finish the lettering on one side of the float: “They got freedom of speech and religion, and a vote for all, from the Bible.” Old English font, making it harder; probably 8 hours total on each side. This morning I didn’t have time to finish putting the motor back together. …After work: I finished putting the car back together and took my “faith tester” for a spin. It was rough starting but finally smoothed out. A new code: MAF or VAF. That, too, will cause that motor to stall, or not start. The drive was nice though. But at the end of it, that scary code again: P0336 camshaft sensor! Maybe that was triggered the couple of times when it seemed to lose power for only a half second. I sprayed a special MAF cleaner on the sensor. MAYBE it was triggered from the smoke from spilled antifreeze from putting in the coolant sensor. 12 more days to the parade!!! Well, money, for one thing. For another, the car is not worth as much as what some of the possible repairs would cost, beginning with a few years ago when the key stopped working and we were told only the dealer could replace the ignition system because of a stupid little resister in the key, and that would be $1,000, and it is common for this problem in my model car at its age! So we tore apart the key mechanism, found a resister that matched the resistance of the key and soldered it in the relevant wire, and we have had a keyless car ever since. June 24, Sunday morning: 10 days to the Parade. Yesterday I woke up with the thought that maybe the broken upper motor mount, around which the camshaft and another sensor wire pass, might cause those sensors some violence when the car goes over a bump. So I replaced it; which took a few hours, including 3 trips to a parts store that said they had it but didn’t. After it was installed Dorothy and I traveled in that car to a wedding about 30 miles away. Half a dozen times the motor stalled, once while at highway speed but mostly when accelerating from a stop. But at least each time it started right up again. The most common error code: MAF or VAF high input. An online article says that would account for rough starting and stalling. A leak in the intake air could cause it, so I tightened a weak spring holding the air filter in and sprayed the MAF sensor again. I didn’t drive the car today. Evening: I worked on the float almost all day. Tomorrow I expect to assemble it on the car and set up the masts and ropes. June 25, Monday morning, 9 days to the parade. July 1 is also my deadline for applying for the State Fair parade in August. Evening: I took 2 trips with the car. First, no problem. MAF code, but it drove fine. 2nd trip: the car wouldn’t start. A new sensor costs $122. I’ve replaced that thing a few times but I’m not convinced it was the problem. The electric wire connector is loose. I pushed hard on it and the car started, though still generating a code. I should replace the wires; then if there is still a code, replace the sensor. Just the wires are $27! Maybe I will just put some baling wire around it to tighten it! I still keep finding things to do on the float! It’s still in the basement! The next float project is to carefully disassemble it, with a picture of each part I take off and using the computer to describe it and how many bolts are involved; and to time how long each step takes. Then I need to put it on the car, repeating the process. Work remaining: while on the car, measure and finish masts, crows nests and ropes. Then I need to see if I can put the whole thing, broken down, on and in the car for traveling, strapped down. Then I need to paint the signs on the sails. Then I need to take it to the store and practice assembling, and timing assembly. Then it will be done. A little weird looking, because the float fills up the basement living room; the camera didn’t have a wide enough field, so I had to stitch pics. June 26, 8 days to the Parade. I sprung for the whole $160 to replace the MAF sensor and the wiring. Yet twice in the next 5 miles, the motor stopped while I was on a busy street. Fortunately it started again before the car stopped. The camshaft position sensor is still giving off error codes. At least the MAF codes have stopped. There is quite a knock when I go over bumps. Is there another motor mount that needs replacing? Could that cause something? I need to ask someone. I need to do the sensor test. June 27, Wednesday, 1 week to the parade. Why aren’t I worried? Peter walked on water but saw the storms, doubted, and sank. I see the storm but it just makes me work harder. I have faith that God will make this project possible. Not necessarily easy; God likes His people to work hard and smart. But possible. So what if in one week the car is still stalling? Is my faith blind enough to plunge ahead even then? Even with the risk? It’s like when rocket launches were televised live on the three major networks. Problems arising at the last minute would be explained, and solutions sought, and risks weighed. Then it was up to one man put in charge of making that awful decision, whether to abort or launch. It would be convenient if God would just tell me. But no, He leaves us to use our wits. Today I put the float on and in the car and drove it to the store and assembled it there. This was an important test; to see how safely it would pack on a car, and how long it took. Assembly took several hours. Then after that I worked on what I could not in the basement: the masts and ropes. I finally quit at 11:15. With 2-1/2 hours out for lessons. Tomorrow it’s time to paint the lettering on the sails. And pour water around it. And make brackets to mount the rods that hold the water. And see how well it floats. And call Ken to see if he wants to see it. 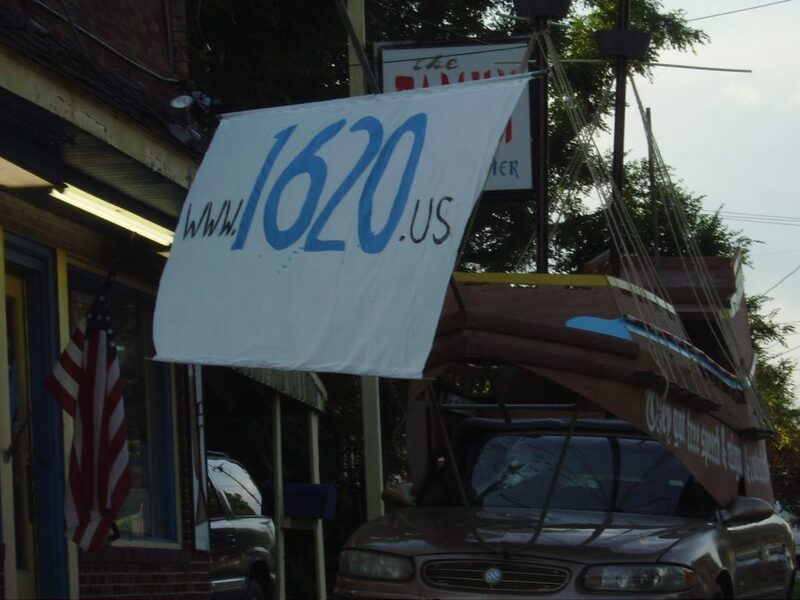 www.1620.US, written on the sail, is my documentary, made 10 years ago when I traveled to Plymouth, Massachussetts during a convention of the General Association of Mayflower Descendants, and interviewed the world’s experts on what really happened in 1620. The picture reads, “A holy Partnership Machine”. “Partnership” is painted in the shape of the Mayflower, sort of. “A holy” is barely readable. It’s red. 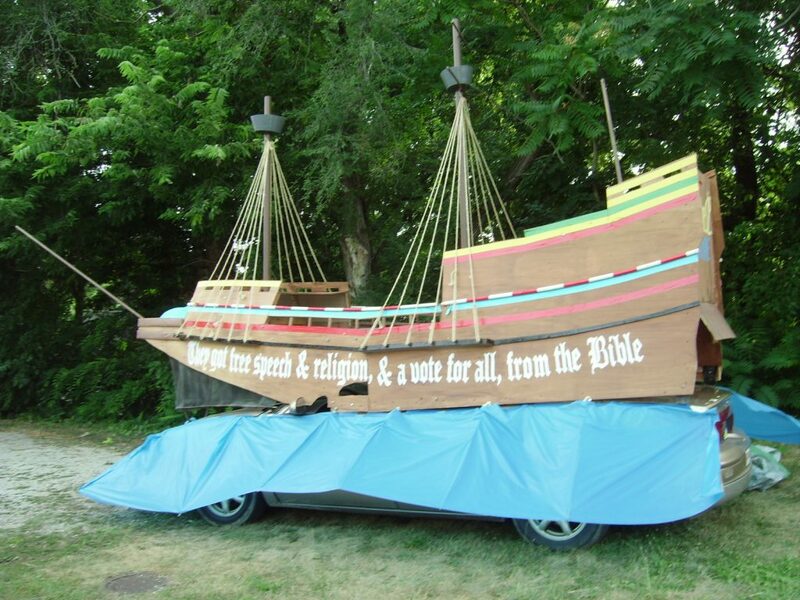 The message on the side of the float says “They got free speech & religion, & a vote for all, from the Bible.” From “The Works of John Robinson”, their pastor, i learned the Scriptures upon which they founded these three freedoms. They were not relegated to some obscure corner of his 1,000 extant pages, but took up a few articles of their catechism. 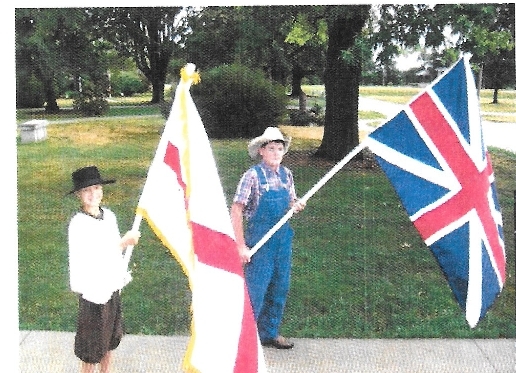 From the Mayflower experts, I learned how the Separatists (Pilgrims) put those principles into practice: in a “Sabbath Afternoon Prophesying Service” which was a forum in which all could speak on any topic, and where dispute or disagreement, so long as it was respectful, was not punished as it was in England but was patiently heard and addressed. Kind of a microcosm, or a seed, of the America we know today! June 28, Thursday, 6 days left! Why don’t I feel the least anxiety about the car? Yes, it would be unthinkably embarrassing and tragic if the car stalled and wouldn’t restart in the middle of the parade, blocking all later entries! Even to have to restart, treating viewers to the sound of a starting motor, would be very uncomfortable. But the float looks so good! And it carries a message powerful enough to return people to God. Powerful enough to be a seed of national revival. Atheists, communists, Moslems, pagans, agnostics, Hindus, and just plain apathetic Christians, can’t look at that simple message, “They got free speech & religion, & a vote for all, from the Bible”, without a shock to their worldview that these freedoms, which they do treasure nearly as much as life itself, did NOT come from their worldview but from the Bible. It challenges the myth that these freedoms came from a bunch of slave-owning nonChristian Renaissance philosophers. It raises the question how these freedoms can continue to the extent free people abandon the Bible. And there is my documentary which tells how this happened, from the world’s top authorities in what happened in 1620, and from the writings of the Separatist pastor John Robinson who left behind 1,000 pages of Bible study, including a short Catechism which gives chapter and verse for these freedoms. So how can the car possibly stall? I know, intellectually, that it still can. But I intend to do everything I can to solve it before next Wednesday, and I have unmitigated faith that I will. Today, make protective shields to keep rain out of the car (the float requires all windows and the sun roof to be wide open), brush the stain on the masts; I had thought to buy another can of brown spray paint, but I think the stain might stick as well and look better. 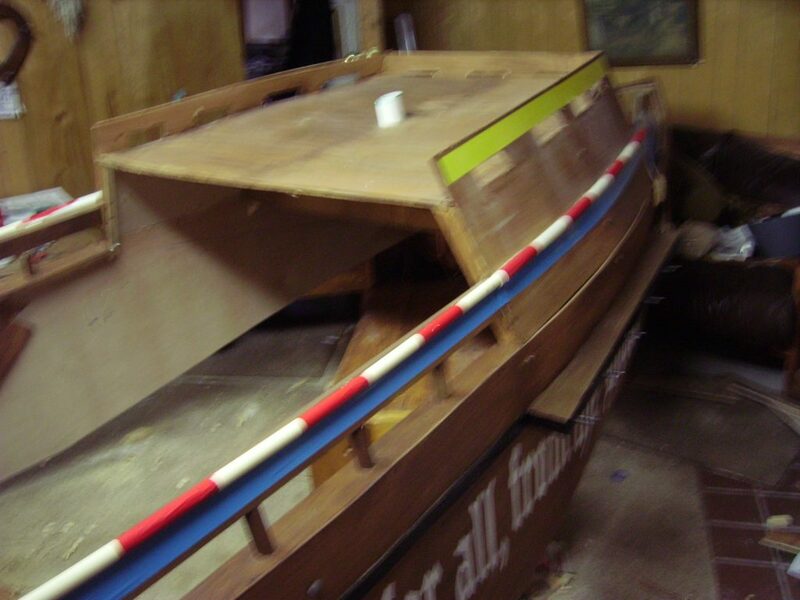 Then finish the ropes, paint and mount the sails, then organize everything and estimate assembly and disassembly times. All done! Maybe, leave it up tomorrow, Friday, also. Evening: It rained a little. 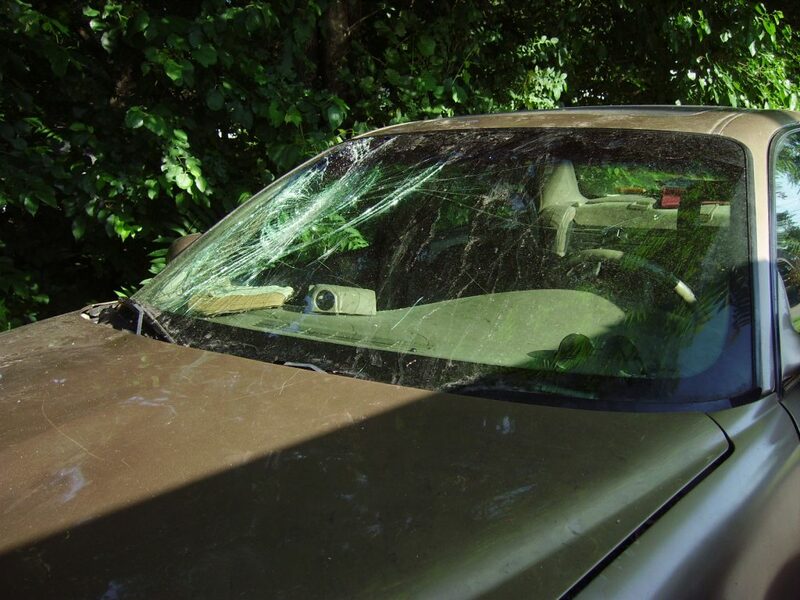 While working on the wet car, walking on the windshield, I slipped and landed on my back on the windshield, thoroughly cracking it and leaving about a 3” deep impression about the size of my back. Why doesn’t even this “storm” trouble me? Well, when I think about it, does it count as somewhat of a miracle that a 72-year-old guy can land on his back on top of his car and result in no pain, not even a headache? And nothing to hinder me from continuing my rather rigorous physical work? Psalm 37:23 The steps of a good man are ordered by the LORD: and he delighteth in his way. 24 Though he fall, he shall not be utterly cast down: for the LORD upholdeth him with his hand. 25 I have been young, and now am old; yet have I not seen the righteous forsaken, nor his seed begging bread. 26 He is ever merciful, and lendeth; and his seed is blessed. 27 Depart from evil, and do good; and dwell for evermore. 28 For the LORD loveth judgment, and forsaketh not his saints; they are preserved for ever: but the seed of the wicked shall be cut off. I got some bleeding scratches above my left elbow, though. Later while working on blue lettering on a plastic sail, I got blue paint on my right arm. How appropriately patriotic! Blood red on one arm, blue on the other, on white skin, while preparing for the 4th of July! Dorothy located a window repair shop that advertised itself as the cheapest around, with customer reviews saying it was half the price of others. $179; I really was expecting to have to pay twice that. The appointment is set for Friday at 3. Where is this money coming from? Every six months we have to pay over $3,000 in property taxes. We’re robbing that savings. Before bedding down for the night, I disassembled the float again. It took 35 minutes for the front half, and 25 minutes for the rear half. The front and rear sails are now finished. All the lettering is done. All that remains is the ocean. I did that camshaft sensor test. H wire is fine. Goes on and off as motor is turned. G wire is always on! It is supposed to go on and off faster. Hmm. The test instructions say replace it if it is always off, but no possibility is suggested of it being always on. 3 pm: I’m ready to get the windshield, but the car won’t start! I tried each minute for 8 minutes! I called; he can still do it if I get it there soon. Not starting at all is a serious red flag. Enough to seek some assurance from God before proceeding. Am I already suffering persecution for it? Maybe I don’t need the float in a parade. Just in our music store parking lot, not even finished, got me on “People of Des Moines”, a very negative, personal attack facebook site. But now I received a copy of the post and there is no comment. 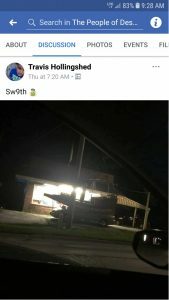 Just a pic, at night, and the guy’s name who posted it. 3:24. I tried to start the car every 10 minutes, after 3:00. Still no go. No error codes. I believe I’m ready for a fast. In the Bible lots of people fasted to get directions from God; I perceive no explanation why, or how that works, or if it works, or if people just lost their appetites out of concern. I still feel no fear, no anxiety, no depression, no stress. I feel a determination, a focus, on understanding any role I need to play in solving this. But peace, that the outcome will be good. For which I am very grateful. 3:31, time to try the car again. Still won’t start. I will work on the float for the next few minutes. The ocean is almost ready. He is in Ireland for 2 or 3 more weeks. But his brother, I suppose, recommended Livingston, for better diagnosis. 5304 SW 9th St Phone number (515) 287-1372. I left a message. 5:54 pm I’m breaking my “fast”. Wow! That was 2-1/2 hours! I just feel confident. The sensor is only $36. It was a horrible job before to replace it, but maybe it won’t take days this time. If it does THAT will be God’s answer for me about this parade! But right after someone at Livingston finally answered the phone only to tell me the techs all left an hour early today and are off Saturday, so they won’t be back until Monday, ruling out THAT option, so I had decided maybe replacing it myself can’t be that bad, a sax repair came in for a gig tonight, for which I charged $80. Forgot to mention before, right after I fell on the windshield, a teacher came in with a $1500 order. Not all profit, but our profit will be well over the windshield cost! 11:47 pm I replaced the sensor in two and a half hours. The job I had dreaded so long, was easy. What had stumped me before was not knowing how to hold the crankshaft pulley still while I unscrew the bolt. How do I keep it from just turning the motor? Well duh, stick a screwdriver in one of the service holes and it will stop when it hits the metal wall. Yet the car still won’t start! So my fast is back on. I’ll take the rented tools back for credit tomorrow morning, and see if the folks at the parts store have any ideas. Other than that, prayer is about all that’s left to do. June 30, Saturday, 4 days to the parade. 11:50 am I returned the rental tools, and got a spark tester. No spark! So I’m taking the control module back to the parts store to have it tested. 5:48 pm I don’t know if anyone will read this but me. But for me, this is becoming more important. About 4, I took some nourishment. It seems fasts, along with an urgent concern, are real good for clearing your mind of almost anything but your concern. But when work must still be done, I was feeling zero interest in it. I didn’t even want to stand up. I don’t mean to generalize to all fasts; I’ve fasted for 3 weeks before without hindering my work. Still no answers about the car. Dorothy started searching online, which I appreciate. But she wanted me to stand up and come over and watch the youtube videos she found, which is when I took nourishment. Livingston Auto is closed till Monday. The fellow at O’Reilly thought the only thing that can cause a car to not start at all would be a bad ignition module or the crankshaft sensor which I had just replaced. So I went back and pulled the ignition module and took it to him to test and it was fine. He said it’s possible he could have sold me a bad sensor. It’s taking more focus to keep from feeling anxious, depressed, or irritable with others. I feel like Israel in the desert, murmuring at the next challenge, unable to remember how easily and majestically God had disposed of the last threat. I finally reached a mechanic who doesn’t have time to work on my car but said the only other thing might be a broken timing belt. But he doesn’t know how to diagnose that without tearing into it, which my car book explains requires removing that huge crankshaft pulley again, and the sensor, several other sensors, draining the oil and coolant, and removing the oil pan. But surely I can rule that out because (1) if it was completely broken I would hear it clanking when I turn over the motor, and (2) if it was not completely broken but had slipped, it would still produce a spark, just not at the right time. I’ve been trying to test the ignition and crank relays in the under-the-hood fusebox. But mostly I don’t feel motivated to do much of anything. Except just sit, and think, and remember God’s promises, and remember His desire that we put utter trust in Him, free from all fear, because fear feels like Hell. Perhaps it is not far from precise reality to say fear IS Hell. In a little bit I need to fill out the State Fair Parade application, with its $25 fee. Deadline is tomorrow, for a postmark. After that there is a $15 late fee. In the Urbandale parade in 4 days, I am the 102nd entry. Out of 112. The simple solution would be to lower my goals. Forget the parade. Forget the message calling Iowans back to God. Junk the car. Watch TV. That seems least likely to be God’s first choice, so tonight after I get the application in the mail I suppose I will come back to the store and put finishing touches on the float parts. Definitely, without trust in a great power of Love and Truth far beyond any ability I have, “realism” would force me to lower my goals safely within my very limited capacity. 6:33 pm I FINALLY figured out how to test the ignition and crank relays. They work fine. Now to make out that State Fair Parade application. 7:22 finished. Now to the Post Office. Urbandale, where the parade is, was hurt bad. Earlier, I reached Greg. He, too, thought a timing belt could be the problem. He told about a black timing belt plastic cover I could remove, not the upper plenum, but I found nothing like that on my car. So I gave up: there is nothing more for me to even think about, concerning the car, before Monday. July 1, Sunday, 3 days to parade. Past midnight: This morning, I searched in vain for information on timing belts. A lot of thinking, praying. Then I played in a concert of our Iowa Military Veterans Band. After that I went to the store and did finishing touches on the float; another coat of paint for the masts, and brackets for the rods that hold up the ocean. Then I went to parts store to talk with Justin, the manager. He thought about it for quite a while but could think of no solution. He gave me the name and location of a mechanic who the store relies on a lot, whom I can contact Monday morning. Justin commended me for my peace, but I had to confess that even a stoplight triggers a twinge of impatience in me. How much patience the people with flooded homes are learning this weekend! Back at the store, it occurred to me to check the ohm reading of the resistor I had wired into the ignition. Dorothy had been asking me about that original work I did to bypass the ignition when the ignition failed. I had checked to see that the resistor wires hadn’t broken. But now it occurred to me that maybe the resistor had failed. Cars for the last 20 years have a resistor built into the key. Not only does the key trigger a unique set of tumblers, but the resistance must be what the computer expects or the car will turn over but not fire. So when the resistance reader in the ignition failed, replacement of which must be done by the dealer for $1,000, I tore out the key tumblers and wired a matching resistor into the wires. I couldn’t remember what the ohm reading was of the resistor I had used. But when I measured it today, it was 1254 kohms, a number that didn’t sound familiar. And it was not a stable reading, but floated back and forth around that number. It seemed off by a factor of 10. So I began thinking that could be most of the problem. But I needed to find the right resistance. I couldn’t remember. I searched my computer for some record of it. Couldn’t find it. With my jeweler’s glasses, I copied down the numbers on the resistor and searched for them online, but got zero response. This evening Dorothy had the idea of driving over to the setup spot for the parade. On the way a thought hit me: resistors are not sold singly. Where did I keep the extra resistor? So on the way back I stopped at the store and looked in a drawer where I keep electrical stuff, and there was a package of a dozen of them! So suddenly my mood shot way up! Tomorrow, first thing, before talking to mechanics, I’ll solder in a new resistor and see what happens! July 2, Monday, 2 days to the Parade! now it’s 10:39, and I’m ready to put on my shoes and go fix the car. It didn’t work! I went to a mechanic relied on by O’Reilly; can’t imagine the problem; wouldn’t know what to test if he had it. I went to Livingston; they offered to try to check it, in 2 weeks. They suggested The Garage. I went there; they are willing to look at it tomorrow if I get it towed. Now I’ll go back to the store and double check if all the resistors in the package are the same. Then I’ll go buy the windshield to put it in myself, so that will be done; then I’ll head to visit Stan Gruhn on Euclid to see if he has any tips. I checked the resistors. 11.87 ohms. Consistent. Solid. The same with the old one, after it was removed and I could get a clearer contact. So from that, it appears the resistor was never the problem. I talked to Stan. He doesn’t see how anything done with the fuel injector wires could shut down anything, much less fry the computer. The most he could come up with to do was to see if juice is getting to the relays in the fuse box; especially the fuel pump relay. I asked what that would tell me to do, if there is no juice. He said, trace back the wires to the…what? the computer? Then what? I asked him about windshield replacement tape. He showed me a $25 product, a box with a rubber seal, and a $27 tube of caulk. He indicated one could use either, but the caulk is such a limited quantity that it is very difficult to get an even bead all the way around without running out. But he was out of the $25 seal, so he directed me to another Advance store. There, the fellow told me I needed both products!Well, since the windshield is $100, that puts total cost for me to do it, at about $150, compared to $179 if I have it done. Although an important reason to do it myself, today, is in case there isn’t time tomorrow IF the car gets running, it seemed too much. At some point the cost and the time seem too much. So I came home to pray, to see if the pagan has responded again on my Youtube video, and to type these notes. But now that I think more of it, I feel like going to a different parts store, buying whatever they recommend, then going to get the windshield, and getting that out of the way. I’ll also do a test Stan recommended: take off the fuel pump relay and short the wires to see if that makes the fuel pump work. The appointment tomorrow is at The Garage, 4824 SW 9th St, Des Moines, IA 50315, (515) 210-9890. I need to call AAA to arrange for towing. OK, I called AAA. Timing is complicated. Maybe they won’t arrive until 6, or maybe a lot sooner. It’s 3:30 now. I’m sure glad I’m not in a blizzard! But they will call with a time estimate; if it’s before 5 then I can have it towed now; otherwise after 8 tomorrow morning. But AAA says if it’s towed to one of “their” shops, they guarantee it will be diagnosed in one hour! And there will be a 50,000 mile warranty on the repair! It would be Scott’s Automotive 362-5694. I called. Left a message; no one answered. I am inclined to fear the cost of such service! And I am inclined to think The Garage can diagnose it in an hour, even if they can’t repair it that soon. Anyway, I have until the tow truck arrives to decide where to take it. 9:42 pm Since AAA hadn’t called me by 4:30 and both The Garage and the junkyard where I get the windshield close at 5, I assumed they would never make it by 5 so I went to buy the windshield so at least I could get that out of the way tonight. Were AAA able to get the car to the garage before 5, then I wasn’t going to buy the window, since it would be locked up inside. AAA’s modus operandi was for them to call me with a time estimate of when they would come; should they call after it was too late, I was going to ask them to do it tomorrow. That’s what the receptionist told me. But the driver didn’t bother calling; right at 5, as I was finishing the transaction for the windshield after 20 minutes of junkyard folks trying to locate it with their internet down – a city garbage truck had gone down the wrong street and pulled down a few power lines – AAA called and said he was already right there at the car! So it was going to be towed, but not placed inside the garage as was preferred, and after I had purchased the windshield. Well, I worked 3 hours on the windshield, outside The Garage, until it got dark. I got the old windshield mostly loose, and that’s as far as I got. I called The Garage about 8:30 am. They were unsure how to proceed. Electrical diagnosis is $100 an hour, and he couldn’t promise he could solve it after taking a lot of my money. He explained that while there is nothing “wrong” with the several wiring jobs I have done when I replaced fuel injector or MAF sensor plugs, that would keep a car from running, using their computer diagnostic tools is different. They can produce minute differences in voltage that would cause the sensitive car computer to mislead them about what is happening where. He gave an example figure of $300 and still no results. I answered that if it comes to $300 I will accept that risk; let me know before you dig me any deeper. Other than differences in magnitude, this is like a human family member in an operation. We pray God will direct the doctor. Except that here, we are more concerned that God do it quickly. Another similarity: there may come a time where we must decide whether to let the doctor quit trying. Yes, junking the car, today, is a possible scenario. After all this work, time, money. How would the thinking be different of an atheist in my situation, aside from the fact that an atheist would not go to such lengths to glorify God and His Bible? Psalm 37:3 Trust in the LORD, and do good; so shalt thou dwell in the land, and verily thou shalt be fed. 4 Delight thyself also in the LORD; and he shall give thee the desires of thine heart. 5 Commit thy way unto the LORD; trust also in him; and he shall bring it to pass. 6 And he shall bring forth thy righteousness as the light, and thy judgment as the noonday. 7 Rest in the LORD, and wait patiently for him: fret not thyself because of him who prospereth in his way, because of the man who bringeth wicked devices to pass. 8 Cease from anger, and forsake wrath: fret not thyself in any wise to do evil. We Christians have often experienced that what God does in answer to our prayers is give us not what we expected but something which only in hindsight do we recognize as far better. For example, did I mention the testimony of the O’Reilly manager, Justin? He still suffers brain damage – loss of memory, of concentration, because of an injury when he was 13. A bigger, older kid did a “pile driver” on him, the name of a “pro” wrestling move where a person, standing, has his victim upside down, arms around his victim’s legs, one leg around the victim’s chest, and jams him down into the ground. On a soft squishy wrestling ring with several layers of carpet, one might survive that; anywhere else it is generally fatal, causing a snapped neck. Justin had it done to him on concrete. But the Bible calls us to do more than wait passively to see what God thinks is best. Like an indulgent parent ready to paint his child’s room, God doesn’t want to hear us say, “well God, what color is in your will?” A parent doesn’t care. A parent relishes his child’s decision. God, likewise, invites us to pray for specific good things. Like any parent, God even allows a little latitude when we want things God isn’t that excited about. Luke 18:1 And he spake a parable unto them to this end, that men ought always to pray, and not to faint; 2 Saying, There was in a city a judge, which feared not God, neither regarded man: 3 And there was a widow in that city; and she came unto him, saying, Avenge me of mine adversary. 4 And he would not for a while: but afterward he said within himself, Though I fear not God, nor regard man; 5 Yet because this widow troubleth me, I will avenge her, lest by her continual coming she weary me. 6 And the Lord said, Hear what the unjust judge saith. 7 And shall not God avenge his own elect, which cry day and night unto him, though he bear long with them? 8 I tell you that he will avenge them speedily. Nevertheless when the Son of man cometh, shall he find faith on the earth? So my prayer today is: “Father, as Isaiah pleaded, so I plead: send me! Make it possible for me to be a voice for You to my generation! “You know how much time, money, and work I have invested in this project, to inform Iowans that it was following your Bible that created the freedoms of speech and religion, and a vote for all, that even the atheists of America treasure, and that the whole world envies. Don’t let that message be stifled! Allow me to glorify Your Name and Your Bible. “And I thank you, and marvel, that you, like any parent, do not seek glory for your benefit, to satisfy your ego, but for ours, that mankind might turn and receive the wonderful gifts you have created for us at such great cost! 1:34 The Garage just called. After 3 hours work they found nothing but weird readings But mercifully they will only charge for one hour. They recommended Town And Country Motors, 913 SE 14th, who can figure out electrical stuff very good. So I need to contact the parade folks to cancel, and AAA to tow. Really? 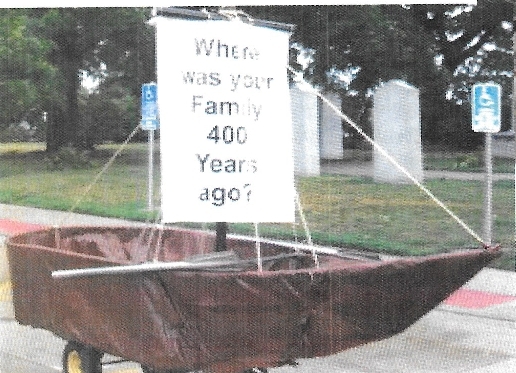 Pictures, on a website about Iowa’s biggest parade, of a parade entry that dropped out? I have enough general expectation that God knocks down one building only to build a grander one, that Pastor Weaver’s offer to put pics online, something utterly unexpected, completely took the punch out of my disappointment. Hi! Thanks for your offer to post a pic or two of my float, even though it can’t make the parade. From “The Works of John Robinson”, their pastor, i learned the Scriptures upon which they founded these three freedoms. They were not relegated to some obscure corner of his 1,000 extant pages, but took up a few articles of their catechism. The top of the picture of the back got clipped off: it reads, “A holy Partnership Machine”. “Partnership” is painted in the shape of the Mayflower, sort of. In the last picture the whole “Partnership” is visible but “A holy” is barely readable. It’s red. July 4. I stayed home; went to the music store to finish repadding an alto sax to pay towards the bills this float and car repair have run up. My rough estimate, before I get out all the receipts and count them up, is that I have spent about $200 on the float and $800 on the car. The car repair costs were completely unexpected. So what shall I conclude? Did God answer my prayers? Can I still believe God answers prayers? To put it more personally: Can I still believe God will answer MY prayers? Can anyone who reads this – an event which seems to me highly unlikely in this life – take courage from this testimony that God answered my prayers so maybe God will answer theirs too? Why don’t I feel disappointed? Strange. Why do I feel happy? Content? In fact, more content than a couple of days ago? More at peace? God certainly answered most of my prayers, and met all my needs. I don’t feel abandoned. * I fell on my back on a glass windshield and was not hurt. Not even a headache. Not even the scratches hurt. * Business has come in equal to the expenses I have run up – we didn’t have to use our credit card. The promise of Luke 12, that God will cover our needs when we work first for Him – when we “seek first the Kingdom of Heaven” – has never failed during the 30 or 40 years that I have relied on that promise. * The message was at least seen on SW 9th, and will be posted on the parade website. * The float turned out much better than I had imagined, by all three criteria: (1) it must be realistic looking – recognizable from photos of the Mayflower II, (2) it must be able to be transported on the car, and assembled, as well as torn down and packed back on the car, within an hour; (3) there must be good driver visibility without distracting from the appearance of the float. A bonus fourth criteria that I had not thought of was met: (4) it must be capable of carrying a few passengers, yet must look good even if there are none. That is achieved with the teddy bear idea. * It looks so good, with the sides shaped and warped better than I had hoped yet sturdy, that I am inspired to make it better. When I began I had only some online photos, which got pixelated when I zoomed in. Later Dorothy found a couple of postcards I got way back in 1965 when our family visited the Mayflower II in Plymouth, Massachusetts. I am amazed at how much that “old technology” is than today’s! I could see detail much more clearly, and I saw what it looked like before another half century of weathering and repainting. When my float goes out again it will be a work of art. * I was protected from the specter of a car which I had expected was finally reliable stalling in the middle of a parade! * This isn’t over. The setback has not stopped anything but only delayed. There is still the State Fair parade in a little over a month, and several other parades in Iowa and throughout the Midwest next year that I am aiming for. So the answer to “did God answer my prayer” is much like the answer to “do parents give good things which their children request?” The answer is always a qualified yes; often not when the child expects or would prefer, and often with conditions to keep the gift safe and beneficial. My car was not ready. I didn’t know that; but the failure came late enough to keep me readying the float, but early enough to cancel this first parade. And steps are in motion to get it ready soon. With the work I have done, my wife is more supportive of spending the money necessary to make it not in vain. That is helplful. The project was hardly for myself. It was for God, and for people far from God. So when it didn’t succeed in the way I hoped, at least it was no loss to me personally. Long ago I stopped worrying about my own problems, trusting God to take care of them as Luke 12 explains; now nearly all of what worrying I do is about other people’s problems. There is still the struggle with fear and stress, but when it is for the sake of others and not myself it is different. It is closer to invigorating than debilitating. It makes me younger than it makes me older. In any case, I have thought of ways to make the float better, in preparation for the State Fair parade, by which time there will be plenty of time to get the car working reliably. I will replace the duct tape stripes with paint; I found out that duct tape wrinkles in the sun’s heat. I will reinforce the front left and right sides with 3/4” slightly curved conduit, to reduce the danger of breaking when I am carrying it into position. I will make mounts for a couple of fishing poles to dangle candy bars against the ocean. This has been expensive; but it has been only hundreds of dollars. Others soak thousands into their cars and still have problems. Why should I be exempt from what everyone else experiences? Just about everybody spends a lot of money on their car, and often for nothing. When Jesus came, He didn’t ride a camel. He didn’t build a helicopter. He didn’t float on a magic carpet. He walked, like everybody else. We are called to do almost everything the hard way: the same way that everybody else has to. Still no word from Town and Country Motors. I called Wednesday morning; they said they hadn’t started on it yet. So I drove by after work to put new license places on it, expecting it to still be outside, but it was inside. So that evening I emailed Dennis Schmidt with a history of the car’s problems. That night I dreamed that Dennis came into my bedroom to go over the email with me. Today I rearranged the float parts in our music store so they take less space and display better, by standing them on end rather than horizontally. As I did so I weighed each part. I found that the total weight is 225 lbs. I had forgotten that goal of my float construction: to make it light weight enough to trigger zero concerns about the car’s ability to handle the weight. I am glad to see that goal met very well! The car is rated to hold 5 adults each weighing that much, plus a load in the trunk, for a total of 1200 to 1500 pounds. Since I weigh about 170 lbs and the float weighs 225 lbs, the total is only 400 lbs. That’s the weight the car will carry on its way to a parade. At the parade up to 3 riders could be added, which still brings the total well within the car’s safety zone; especially since at parade speeds, the car could easily carry much more than 1500 lbs. I wrote a song yesterday after I submitted the article. Here are the lyrics. The numbers refer to the verse numbers in 1 Corinthians 13 from which the phrases are taken. Verse 2 begins with John 15:13. “Perfect love casteth out all fear” is found in 1 John. Matthew 3:46-48 explains how our love must reach to our enemies or it is no deeper than the “love” terrorists have for each other, which lasts only so long as it is repaid. Perfect love can never end. 4 Perfect love is patience, waiting long. No jealousy, pride, bragging. Love is kind. 5 Fair. Unselfish. Cool. Forgets a wrong. 6 Grieves to hear that someone fell. Likes to see truth win. 7 Won’t complain. Expects the best. Never quits. Loves to trust. Won’t give up. Won’t lose hope. Meets the need, accepts the cost. Greater love can no man have than this: that he lay his life down for his friend! When you love, ___ whatever the cost Nothing’s left to fear. Terror must end. God loves you and me. When we were His en-e-my He died for you and me to show us re-al life! When we were the eas-i-est to hate! We ha-ted our God! The eas-i-est to love! God chose us to be His wife! Yesterday Town & Country Motors called to say the car was ready! They called mid-morning but I didn’t find the message until after they closed. So this morning I called; the price? I had pictured the labor exceeding the value of the car. I pictured as high as $2,000. The lowest figure I dared imagine was $400. I figured at least $600-700. Dennis Schmidt, the manager, gave me a “band discount”, I was told! I suspect that was a made-up fee, but was told it was 35% of labor and 15% off parts. So without it, it would have been over $600. Besides a “new” (used) computer (PCM), the “harmonic balancer” had bent teeth. He showed me. Perhaps I had bent it taking it on and off to get to the crankshaft sensor. The teeth were bent enough to destroy the new sensor I had just put on. The previous sensor wasn’t damaged like that, so apparently the long “tooth” was bent from the last time I replaced it. The mechanic who worked on it vented a bit about working on it in the heat, cut with the broken glass; he said the optometrist told him the scratches on his eyeballs ought to be gone in a couple of days. His own advice, had it not been for Dennis, would have been to send the car to the crusher. Indeed, few would put up with a car without a key, and a lot of rust damage on one side. Besidest the broken windshield and tires not holding air for long. So since my son is arriving tonight, that gave me the plan of putting the float together on the car (after I replace the windshield) and leaving it parked at our music store over the weekend. I started on the windshield about 11:15 am. It took 45 minutes to finish taking the old one out. Then time to clean it, vacuum the broken glass out of the channels and out of the car interior, and install the new one; it’s 4 pm now; all done, I’m at the store, ready to assemble the float. It was 7pm when I finished assembling the float – minus the ocean, and put the tarp over it to keep out rain. Everything is done except the ocean and some boards to go over the windshield, front and back, so people can walk there without putting weight on the glass. Sunday and today I added pipes on the two front sides bent to match the shape of the wood, to stiffen it especially when I am taking the pieces off the float. I also waterproofed it, (so that when it rains the inside won’t get wet even though all four windows and the sun roof are wide open), and put a shaped screen on the front to sort of cover the windshield. I also replaced a missing rope, which required a splice because I was out of long enough rope that was a single piece. 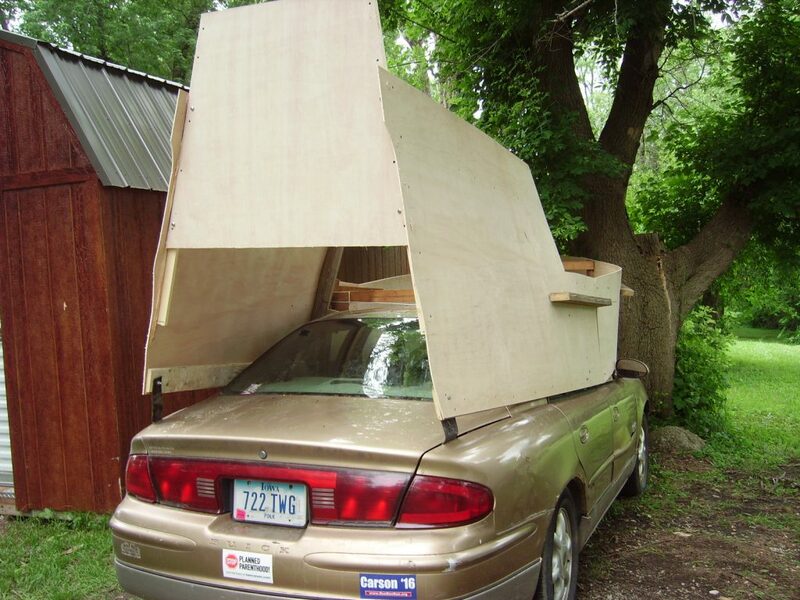 I can’t build the ocean until I take the float off the car again, because the brackets go on under the sides. Oh, I also need to make holders for the fishing poles. Yesterday I spent about 6 hours on the float, just taking it apart, putting it partly back together, then taking it all off and packing it on the car, ready for Wednesday. Improving a few details I can’t even remember now, getting a sense of how quickly I can put it all together. I face quite a deadline Wednesday: they won’t let us into the assembly area until 5 pm, but the parade starts lining up at 6:15. I’m not sure I can assemble it that quickly and get everything done! I timed myself doing most of it, and it took an hour; but I haven’t yet put every last bit of it together. Maybe I better spend tomorrow doing that. Float with ocean, and screen in front, no sailsIt was about 3 days ago that I finished the Ocean. One example of redesign imposed upon me by reality was that when I had the ocean in place the first time, the wind blew it up at a steep angle up, in front, not only looking terrible but blocking my view so I couldn’t drive! I pictured that happening during the parade! I would have to stop my car, climb out the top, walk around to the front, and try to repair it – except I wouldn’t know how at that point; maybe just tear it all off so at least I could drive out of there and let the floats behind me proceed! Well, that wouldn’t be a very welcome scenario! So after some thought and prayer, the solution came to me of reinforcing the front ocean brackets with 1 inch wide by 1/8” strap iron; that should be stiff enough that the wind couldn’t bend it up. After I came up with the solution, it still took me a couple of hours to rebuild the five brackets! Speaking of interruptions from reality, I have though more about my experience with the camshaft sensor, which was torn up because somehow the “teeth” in the “harmonic balancer” got bent while I had it off. In advance of the July 4th parade, I had prayed for a solution in time for that parade. The car was just barely driveable enough for me to be ready to trust it. But I was still without complete understanding about the problem. In time for the parade, God saved me from supreme embarrassment and ruin by completely sidelining the car. And now it is repaired, and I have enough understanding of the former problem to make sense of all its earlier symptoms. What is the lesson of this, as we pray? Often we pray for flat-out miracles. I wanted that car to run so badly that I was on the verge of taking it on the parade trusting God’s miraculous assistance to get through it, as a substitute for me understanding the problem and fixing it. But God showed Himself readier to provide me transportation that worked by processes I can understand. In other words, to provide me transportation that was reliable by the world’s standards, not just by “faith in miracles” standards. Why? Why didn’t God go the “unexplainable miracle” route? Second, God really likes us to participate in receiving the answers to our prayers. Sometimes what we need is flat out beyond us, so we must either give up or trust God. But where it is possible for us to understand and act, God will hold off on miracles and wait for us to take this opportunity to develop our talents, and mature. As I have written, there have been plenty of examples in this diary of God providing what I needed, when I needed it. Just one more: yesterday, after working on the float about 6 hours, and finishing almost by the time Dorothy hoped we could leave to go visit her son in Grundy Center, the very instant I finished, it started sprinkling, so I got in the car to park it under our music store canopy, and just as I pulled under it started pouring. The hard rain lasted several minutes, and gave way to light sprinkling and sporadic rain for the rest of the evening. Weather and money are two things I have gotten into the habit of never worrying about. God provides, consistently. Contact me if you would like to post articles here to help us understand the Light (of God’s Word), or the Darkness (public issues upon which the Light does not shine), or about how we, together, can shine the Light.